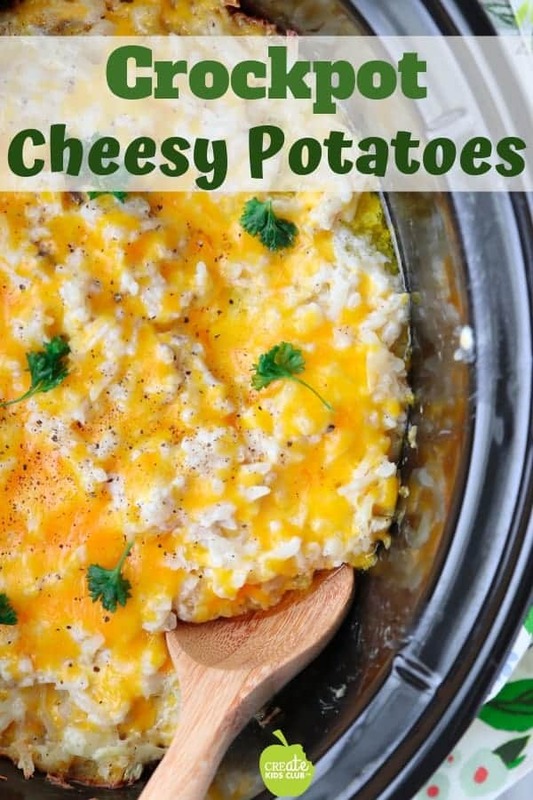 Crockpot Cheesy Potatoes are the perfect side dish for holidays or weekday dinner. 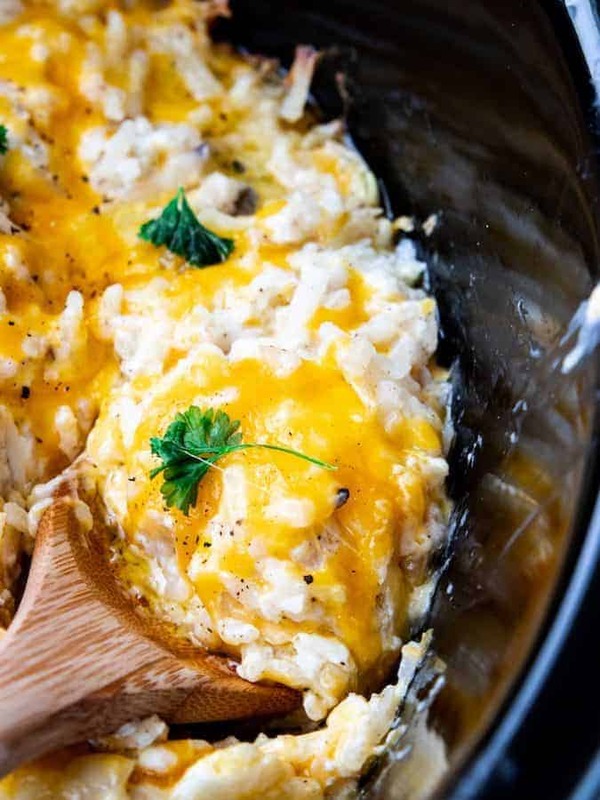 This classic slow cooker cheesy potato recipe is creamy, cheesy, and perfectly seasoned. These potatoes will become a holiday staple on your table! This Crockpot Cheesy Potatoes recipe is an easy, creamy, & cheesy side dish that is perfect for any holiday event, family gathering or weekday dinner. With less than 10 ingredients, you can create a cheesy potato recipe to feed the entire family. Depending on the size of the event, I have even made a double batch by cooking one batch in my slow cooker & one batch in the oven – or go ahead and mix the two together if you have a large enough crockpot or pan for the oven. I have found that people will serve seconds and thirds of this comfort food, especially my husband! 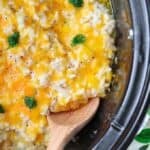 WHAT INGREDIENTS DO I NEED FOR SLOW COOKER CHEESY POTATOES? 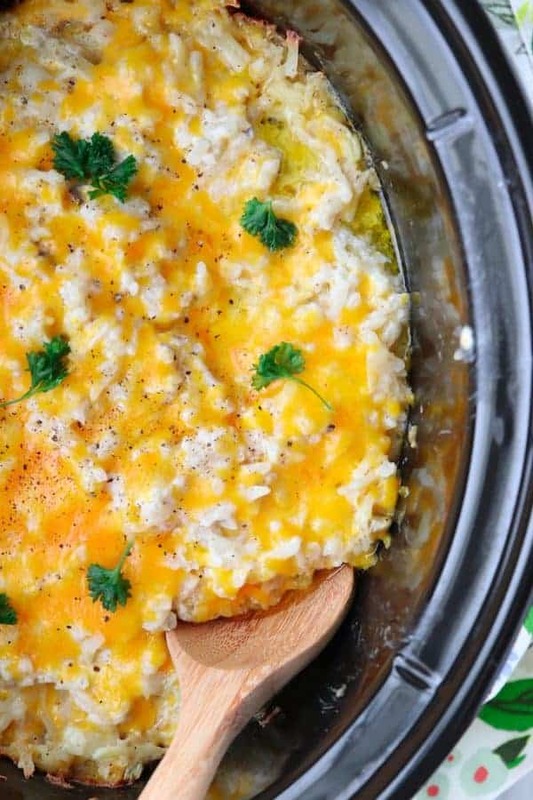 Check out this step-by-step video to learn how to make easy crock pot cheesy potatoes! 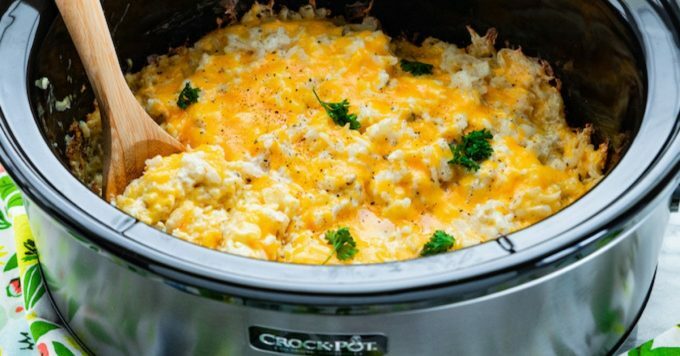 How do you make Crockpot Cheesy Potatoes? Pour into the bottom of the crockpot and cover. How do you make Baked Cheesy Potatoes? Pour into the bottom of a baking dish. PRO TIP: You can bake these potatoes the day before then transfer to the crockpot to reheat. I prefer this route when I need to transport this dish to an event. It was stated that this “double baked” cheesy potato method was by far the best this dish has ever tasted. I received the most compliments ever on a recipe using the bake then slow cook method. 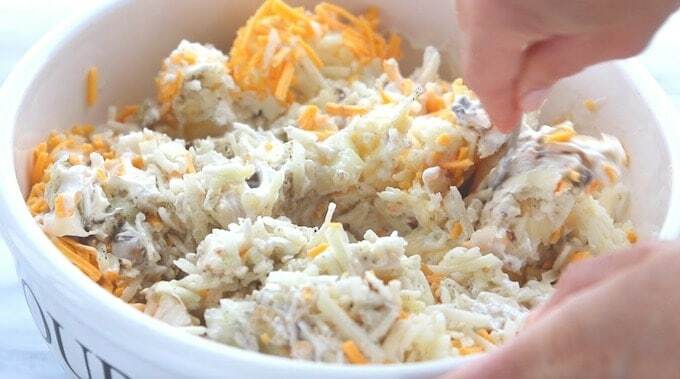 Start by placing frozen hash browns in a large mixing bowl. 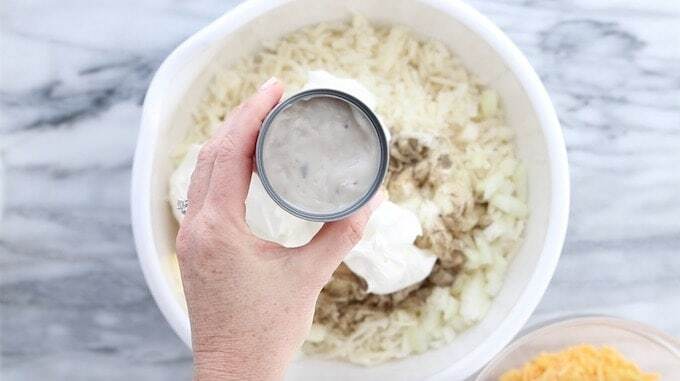 Next, add onions, butter, salt, pepper, sour cream, a can of cream of mushroom soup and cheese. INGREDIENT SWAP: A can of cream of chicken soup can be substituted for a can of cream of mushroom soup if you prefer. You can even make a Quick Cream of Mushroom Soup if you do not have a can of cream of mushroom in your pantry. 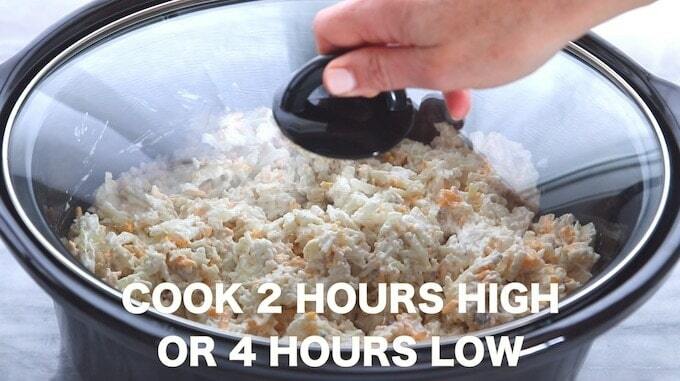 Slowly pour into your crockpot and cook on high for 2 hours or low for 4 hours. When finished, add your favorite garnish or toppings. What other recipes should I try? In a large mixing bowl combine all of the ingredients. Cook on high for 2 hours or low for 4-6 hours or bake in the oven at 350 degrees for 45 minutes. You can bake these cheesy potatoes the day before then transfer to the crockpot and heat the next day. Just printed this off for Easter! Yum!